The boat yard about to become a boat shed. Phil Lambert has been heading up a team of members preparing the yard in readiness for the roof to be put on this Sunday. Kaye’s husband, Mark made posts, Ian organised the post hole digger, George, Warren, Brian were there to dig, scrape, fill, hammer and do whatever else was needed. Yvonne and Jo Keniry were seen lifting panels and holding them in place while the blokes fastened them in – the panels, not Jo and Yvonne – tho the latter is pretty handy with the screwwdriver too. Then there were all those members keeping the food and drinks up to builders – and Jan Richards makes a chocolate slice to die for! There is so much that goes on in Colour City Dragons, often with little or no comment. Did you notice early Jan – the 2nd boat was much in demand, it was almost impossible to move on the little trolley – until Ian quietly put a stronger axle on – it’s a breeze to move now. Remember those fantastic brochures promoting our Regatta, same person just produced the information brochure (for new members) and the abbreviated version for promotional purposes – take a bow Jo Keniry. Alan Reeder, Karen’s husband produced flyers at short notice to promote the Come and Try Session taking place as part of Slow Summer program this week. Have you checked out the Club website recently? After an inactive year it is now updated regularly. An expert with the camera is now taking the ID photos and while the Western Region Regatta 2011 is still 9 ½ months away work has already begun to encourage business houses in Orange to enter teams – all this is thanks to the Web, Word and Camera Witches, Jan Richards, Jasmine Vidler and Claire Buchanan. And joy of joy – the Constitution – a work in progress for over a year has been handed over to Christine Stanger for a final tidy up – Christine, like Mark Rutherford and Alan Reeder, is not even a Club member – yet!! Heartfelt Thanks to you all. This Saturday – the 5th, Come and Try Day as part of the Slow Summer program. Training as usual at 7.15, the Frosties, Community Team will be having their training session at 9.30, this will be followed at 10am by CCDB showing off with a short display – don’t forget to wear your Club shirts – then we’ll be introducing yet more members of the public to dragon boating – I’ve lost track of how many have come along but I think we have had 11 or 12 paddlers new members in January alone and I know there are more waiting till after the Community Team races at CNY. Help will be needed Saturday, especially between 10am and midday, with the boats, the paddlers, the barbeque and the “100 Club”. Chinese New Year – Saturday 12th for Club teams, Sunday 13th Feb (for DAA and Community teams. Have you found your ID tag yet? No tag No Race – Absolutely no wrist bands will be handed out this year. Paddlers need to be at Cockle Bay by 7.30am at latest for first timers, we try to find a convenient spot to gather, we need bagmen/women, they carry the wallets etc while the rest of us rush round looking for missing paddlers. When the final draw is available I will let you know our races – we don’t go on times, always listen for Race Number over the PA. (its very noisy) you need to be in the marshalling area at least 3 races before yours. If you are missing when we head for the loading pontoons – sorry, you missed the boat – literally. There is an 8 minute turn around so no time for waiting for missing paddlers. According to the draft draw our races are well spread out so I don’t anticipate problems. NOW to the social calendar – First – those staying at the Goldsborough Mort (that’s nearly all of us), there is a swimming pool and gym, the lift is so slow – think its an original used in the wool store days. The apartments have everything you need – including w/machine. A room has been booked for CCDB Club at the Bridge Hotel for 6pm, that’s a meeting place in a lively hotel – we then decide do we eat there or head to Dixon Street, I’m still waiting to hear from couple of Chinese restaurants – did think of booking a table at the Marigold but tables of 12 only, so decided against that – my decision had nothing to do with the fact that minimum cost was $1350. Anyone know a good Chinese restaurant? Volunteers are desparately needed for CNY, both days, anyone not paddling and would like to help see Pearl. Officials and Volunteers Training – Pam attended the course recently, not what she expected but found it very worthwhile and looking forward to getting more involved with DBNSW. Its always good to have members with a growing awareness of the rules and regulations. Now, reflecting on past activities. Barbeque at Bunnings cleared a little over $500, with enough meat left over to stock this weekends ‘Come and Try Barbeque’. Ella was delighted with all the help. Great effort everyone. DA Orange – had a stand at the Australia Day Celebrations in Cook Park, mainly to highlight breast cancer awareness and our presence in Orange. We ran a “100 Club’, raising $200 – because the winner of the $100 donated it back to us. We do have 42 numbers to sell on the $5 Club which we hope to sell this Saturday at the Come and Try. Why? Because DA Orange have been successful in gaining a grant for $2000 from Orange Credit Union and $700 from Chris Gryllis Real Estate to purchase a marquee. Too late we were advised by Sydney Dazzlers we should also purchase marquee walls. So DA Orange members decided to order them and use the proceeds of the “100 Clubs” to cover the cost of 3 walls. Thoough Phil did have a brilliant idea to recyle the tarps – it turned out it would cost more than buying the new walls. Leisure Expo – at PCYC Sunday 27th Feb – will need helpers to run the promotional stand – do we have an IT Witch or Wizard who could maybe set up a dvd to run during the show? Any ideas on how to make the stand appealing. Fundraising/socialising– heaps of activities in the pipeline–just waiting for you to offer to help – everything from Car Boot Sales to Theatre Nights and Dinners. Come to next meeting to learn more – hasten to add these are winter projects. Training this Sunday (6/2) again, 5pm for the CNY team. This training time will continue for those attending the State Finals – don’t forget EVERYONE is welcome to participate. If we were sending only the super fit or elite paddlers – well, need I say more. But we are improving and that’s the goal. 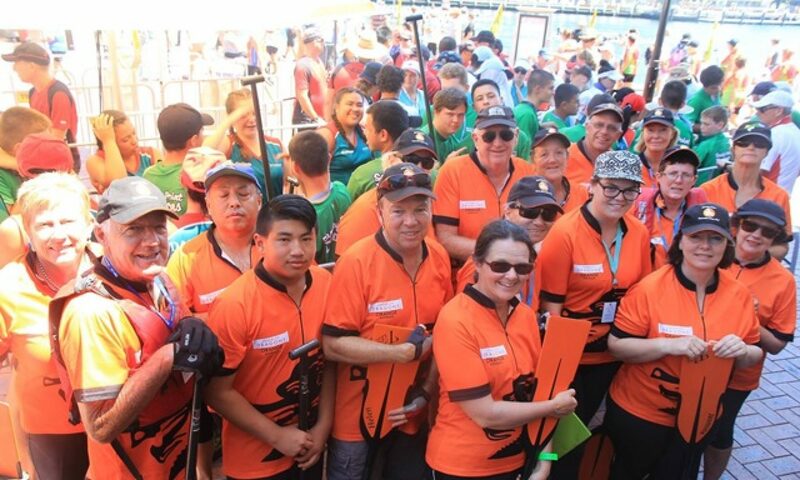 Speaking of goals – theres moves afoot for those going to Penrith for the State Finals to lose the weight of a paddler – and no we are not throwing anyone overboard. The idea is, those wanting to participate, weigh in at training. The goal is by State Finals (March 19th) we have between us lost equivelent of average persons weight. Well I reckon the average weight is 50kg!! All this sounded good – Yvonne and Kristy said that’s no good unless you take waist measurements too, I kind of lost interest at that point – however in the interests of the dragon spirit I’ll give it a go – next week. Lets get this weekend over first. Have a think about joining me. A big thank you to all of you – the last few weeks have been so hectic, not just with the number of members turning up for training but so many people trying it out. In case you hadn’t noticed – we have had between 25 and 39 consistantly for the last month. And yes I did hear Phil Lambert mention a THIRD boat! Don’t ask me how but we have managed to maintain the training plan for the ‘older’ members AND help the newcomers to develop their technique. The Shellharbour Festival of Sport is on March 5. A real fun regatta – if you enjoyed Ryde, you’ll love this one – and we have two Level 2 Sweeps needing to sweep at 2 more races (without incident) to gain their L3 status. Name on the clipboard if your’e interested. Heaps of positive thoughts to Terry for a speedy full recovery – we miss you Terry. And soon after CNY we say farewell to Gloria who will be returning to her home in Canada. You have just become part of the Colour City Dragons and we are going to miss you Gloria. Travel safely and come back soon. $10 steaks and time to relax – this Tuesday after training – at the Hotel Canobolas – just turn up, no need to rush home and shower and change – we’ll look quite clean compared with the mining guys.